Any sustainable community must be self-sufficient and able to exist independently, and that is why working with the community in the planning and execution of our programs is so important to our work. We want the people of Latoti, Haiti to be able to support themselves, feed themselves, and provide themselves with a healthy and vibrant life style–one which reflects the beautiful island they inhabit. The first and most important step towards this goal is the development of clean water. Meetings are held inviting all members of the community to attend. The discussion is open, but focused on health and ecological issues within the community. We brainstorm together and come up with possible solutions. 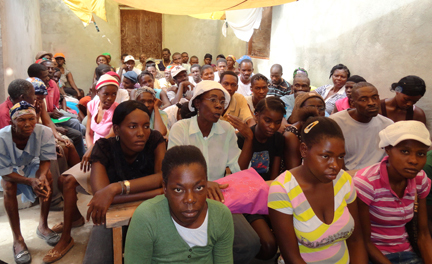 Community members at a meeting facilititated by Bellot Idovia Foundation. Well sites must be assessed, and the water within tested for dangerous bacteria and other contaminants. 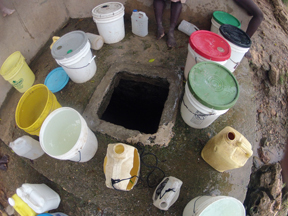 A survey is also done within the communities to assess how many people use a particular well site. With this information, we are able to prioritize our work and focus on the wells most in need of improvement. 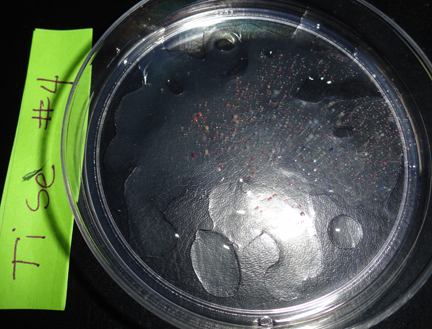 Test results of water obtained by a nearby well (Ti Se). Water tests positive for coliform bactieria. To address the immediate health needs of the community, we distribute durable, high quality water filters based on need, family size, and attendance in educational workshops and classes about community water security. Just a few who recieved water filters from Bellot Idovia Foundation. We educate the community about why clean water is important, with initial focus on the benefits of clean drinking water vs. the familiar dangers of drinking unsafe water. We especially work with organized members of the community, such as local women’s groups. 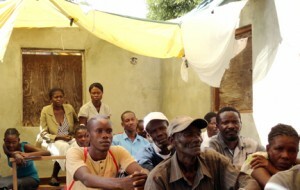 These members of the community are then able to teach members of their household, as well as neighbors. Concerned and interested members of the community attend a workshop on safe drinking water and community water safety.